Marantz PM-KI Pearl Lite review | What Hi-Fi? If you craved Marantz's original KI Pearl amplifier but missed out due to its £2500 price or its limited production run, this Lite version could be the one for you. It's been honed to retain as much of the senior amp's character as possible, at a much reduced price point. And for the most part Marantz succeeds. This is a well-balanced amplifier that combines smoothness with detail and refinement in a engaging way. Listen to Chopin's ‘Raindrop' Prelude in D Flat and the Marantz delivers a solid, stable sound full of conviction. It sounds firmly in control yet lets the music flow. 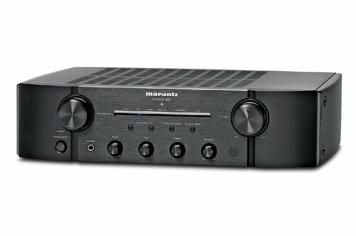 There's the usual Marantz combination of full-bodied midrange, well-defined stereo sound stage and smooth yet still insightful treble. Move to Jay Z's Run this Town and the Lite continues to impress with a muscularity beyond what we would expect from a rated 70W per channel. This is an amp that goes loud and stays composed with it. There's a decent dose of attack and the amp captures the feel and emotion of the track well. On its own terms this integrated does well for the sector, and an early price drop from £1000 to £900 certainly helps make its case stronger. However, compared with top competition from Roksan's Kandy K2 and Cyrus's 6XP it shows slight shortfalls in rhythmic precision and dynamic expression. We emphasise slight, but such is the quality in this class that any such chinks are enough to cost the Marantz a star. Away from sound, it's all good news. The PM-KI Pearl Lite is nicely finished and there's a very definite air of luxury. The feature count is good and there's even a midrange control alongside the more conventional bass and treble for those who like to fiddle. The Pearl Lite is a fine amplifier. It may be pipped on outright sonic ability but it's a good enough all-rounder to make it a serious contender at this price.